Flight Deck Tour - Go Navy Go! The flight deck is where the rubber literally hits the road. The speed and power of the planes, the precision of the crew, and the sheer noise of the jets made it a once-in-a-lifetime experience. Equally momentous was being invited to join the VFA-32 Swordsmen’s Flight Briefing, where pilots were provided with their flight instructions. Witnessing these kinds of operations first-hand was a dream fulfilled for me. Planes are hurled skyward by two steam-powered catapults. These run along a 400-foot track embedded in the flight deck at the bow of the ship. (Two cats in the waist of the ship are used less often than the bow cats.) 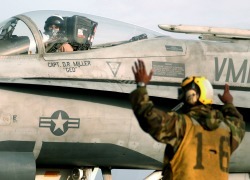 The plane pulls up to the cat, the crew members hook it to the cat while the Jet Blast Door elevates to protect the rest of the flight deck from the plane’s jet blast, the pilot moves the engine to full power, and the cat throws the plane into the sky – zero to 200 miles per hour, over a length of 400 feet, in less than 2 ½ seconds. Ever been to a movie where the sound vibrates in your chest? Really cool. But at 140 decibels, the F-18 engine blast vibrated my chest so much the thought crossed my mind that it might actually hurt me. Of course, as I looked at the crew on deck I realized my fear was silly, but the point is, that’s loud. At the stern of the ship, an arrested landing is even more impressive from the standpoint of sheer precision. 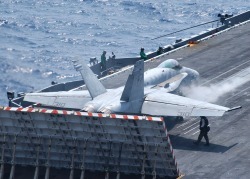 To properly execute an arrested landing, the pilot must cause the plane’s tailhook to grab one of four 2″ steel cables strung across the stern carrier deck. 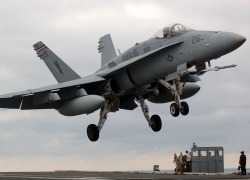 The cable brings an F-18 from almost 200 mph to a stop in less than 400 feet. The pilot’s target on the deck is a box about six feet long and two feet wide, located between the second and third cables. The pilots hit the box almost every time. A testament to their accuracy is the white centerline stripe on the deck, which has been almost worn away by planes landing right on target. Elsewhere, the centerline is bright white. If you pay close attention, you can see this on the video of the F-18 landing filmed from the bridge. Whether or not the tailhook catches the cable, the pilot moves the throttle to full power, the instant he or she feels the wheels hit the flight deck, just in case the tailhook misses the cables. The pilot turns on the plane’s afterburner, too, which increases the engine’s thrust fifty percent by dumping fuel directly into the jet exhaust. 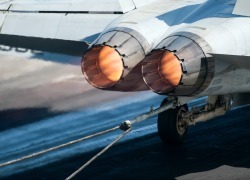 The additional thrust must be applied instantly because it takes the jet turbines about three seconds to “spool up.” If the pilot waited to throttle-up until it was clear the cables were missed, the plane would have too little thrust and would continue off the flight deck into the ocean. In the videos you can see the afterburners come on until the cable brings the plane to a dead stop. Occasionally a pilot misses the cables and has to go around. Rare in good flying conditions, go-arounds are sometimes inevitable at night in bad weather with poor visibility. Even then, they are rare enough that a pilot who does miss has to carry a 15-pound steel bolt in his or her flight bag until the next pilot misses. Why a bolt? Because a go-around resulting from a missed cable is called a “bolter”. As we observed night operations from the Admiral’s Deck, which is the level in the island just above the bridge, the Executive Officer, CAPT Captain John Meier, quietly acknowledged, “None of us enjoys night landings, especially in bad weather.” In heavy seas, the flight deck may move up and down with the swells up to 15 -20 vertical feet – more than three times the length of the target box on the deck. 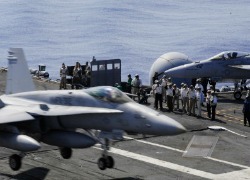 Rarely, perhaps once or twice in every eight-month deployment, seas are so heavy that the onboard computers are unable to keep up with the movement of the deck and the planes. On these days, the planes keep flying. The Landing Safety Officer uses a handheld light to communicate with the planes and manually bring them onto the deck. 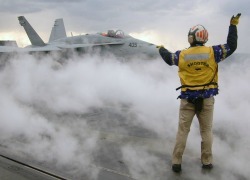 The courage of the pilots – and those who wait on deck to receive them in the most brutal weather for endless hours in a watch – is amazing and inspiring.My own videos and the Navy’s photos offer only a hint of the exhilaration of seeing landings and take-offs on the flight deck live.